When you’re desperate for quick dinner solutions, but still want them to be delicious and wholesome, a modern electric pressure cooker makes life a lot simpler and easier. But there are so many! Which one is the best electric pressure cooker for you? What features would you actually use and which models have those features? 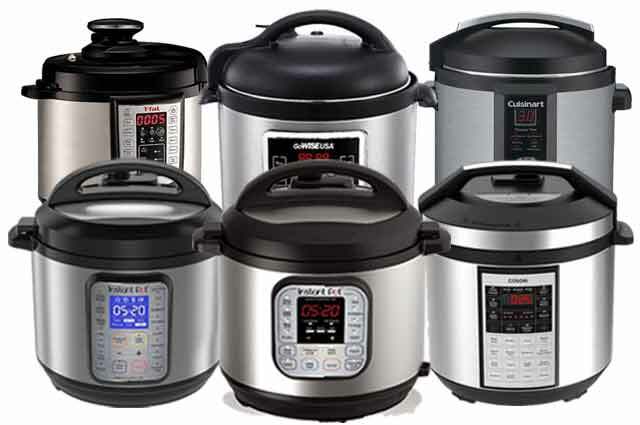 After researching manufacturers sites, professional reviews, and customer reviews of the top-rated and top-selling multi-cookers, I’ve compared and narrowed the field down to the best electric pressure cookers. After reading though this review, you should have a good idea as to which multi-function pressure cooker would be right for you. We’ll also take a look at any drawbacks that may be present with these cookers. Among the few simple items included with these models, are a Steam Rack with handles, a Manual, and a Booklet with a handful of recipes to try out. 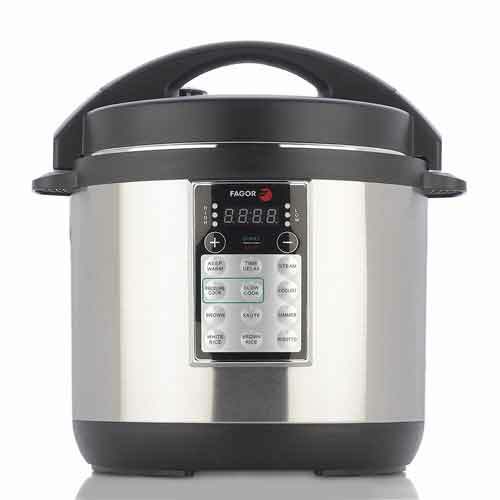 The IP-DUO60 has become one the most popular pressure cookers on the market. Thousands have been sold on Amazon alone, where tens of thousands have left highly positive reviews. 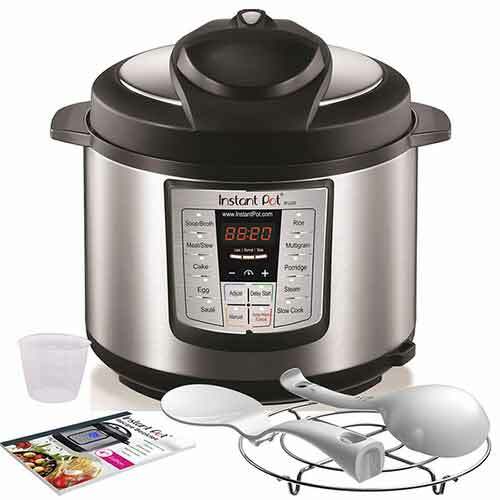 All Instant Pot units have large LCD Screens with Digital Display, Plus/Minus buttons to adjust cooking time. They all have a delay start and a Keep Warm selector that can be set to on or off at anytime. The cookers have convenient Lid rests on both right and left sides of the units so you don’t have to set the lid down on the counter. The main features of the Duo are a good-looking, well-made appearance, with a food-grade stainless steel inner pot, removable for ease of cleaning. I prefer the stainless steel because it’s rugged and won’t leach toxins into your food, as can happen with aluminum or Teflon coated pots. The ‘Manual’ function provides one consistent pressure, high or low, which you set. The other function buttons take the cooker though a pre-programmed cook cycle, which varies the pressures and times of the cook cycle. The cooker fluctuates the pressure by changing the temperature up or down a little bit, for a pre-programmed time interval. Basically, by pushing one of the function buttons, will set the cook time and pressure for that type of food. Personally, I prefer to use the “Manual” button myself and adjust the cook time. Typically, if I want rice with the meal, I always cook the rice separately in a basic sauce pan with tight lid and use the pressure cooker for the meat/vegetable and sauce/gravy combinations. I’ve always found it to be very easy and always come out great. Of the negative reviews, most were complaints of the lid failing to seal properly after prolonged usage. This can be usually be fixed by ordering and installing a new seal. Of the rare negative comments, even rarer were those where the unit failed electrically. The overwhelming majority of people love their IP-DUO, however, a few have had problems with their units that have stopped working. Several of these folks have reported serious difficulties with Instant Pot’s customer service department, and in some cases, of them not honoring their warranty. On the other hand, I have read several reviews where the opposite was true, that customer service had requested proof of purchase and a photo, and they replaced the unit with a new one, outright. I find this pressure cooker to be a very capable unit that you’d find very useful. I’m truly thrilled with mine and how I’ve been able to create the most amazing meals, very quickly. I can easily find dozens of free recipes are sound amazing. I’ve tried many and they were truly excellent. Big hits with my family. If you’re considering purchasing a multi-cooker, this is one of the best electric pressure cookers available. There are many good reasons why it’s the bestselling pressure cooker available today. This unit as only a small 3-quart capacity, although it must be the perfect sized pot for individuals or couples who do small meals at a time! Keep in mind that a larger-sized cooker requires a certain volume of food and liquid in the pot in order for it to pressurize properly. Many recipes call for a specific amount of liquid and volume of food to be used in order for the recipe to work. If you know you’ll consistently be cooking smaller amounts of food, then the 6-quart, or even the 3-quart model maybe better for you. Duo Plus replaces 9 commonly used kitchen appliances – Pressure Cooker, Slow Cooker, Rice/Porridge Cooker, Yogurt Maker, Cake/Egg Maker, Sauté/Searing, Steam, Warm and Sterilize. Stainless Steel – All components in contact with food are food grade 304 (18/8) stainless steel including the lid, the inner pot with 3-ply bottom and steam rack with handles. They are easy to clean and dishwasher safe. Quality Finishes – Exterior, brushed stainless steel finger print resistant with lid holder for left and right handed users. UL certified with 10 proven safety mechanisms provides peace of mind. Highly Energy efficient, cooks your dinner’s for only a few penny’s of electricity. The DUO PLUS is what Instant Pot calls “the next evolution in the Duo Series”. This has all the functions of the Duo, but adds Cake Maker, Egg, and Sterilizer functions. This PLUS model allows you to adjust temperature and pressure settings on all cooking programs to “Less”, “Normal”, and “More” settings. It also has a large Blue LCD digital display screen, and adds the ability to mute the beep sounds, if you don’t want to be disturbed. 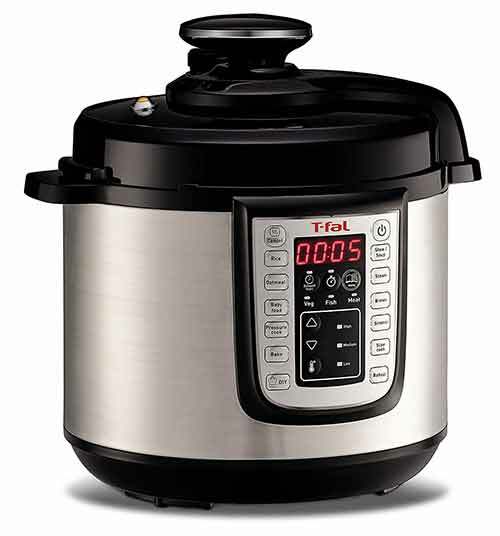 As with all Instant Pot cookers, it allows users to postpone the start time up to 24 hours. I’ve read a few customer comments where they’ve had issues with the seal on the lid of their cookers. Many had been resolved by replacing with a new seal. I’ve had mine over two years now, used frequently and I haven’t had any issues with mine. 6-quart model will hold four pint canning jars for sterilization. A large majority of people are very pleased with the IP-Duo PLUS. However, of the few who’ve had problems, voiced disappointment with IP’s customer service. Several reviewers indicated they were completely satisfied with customer service. 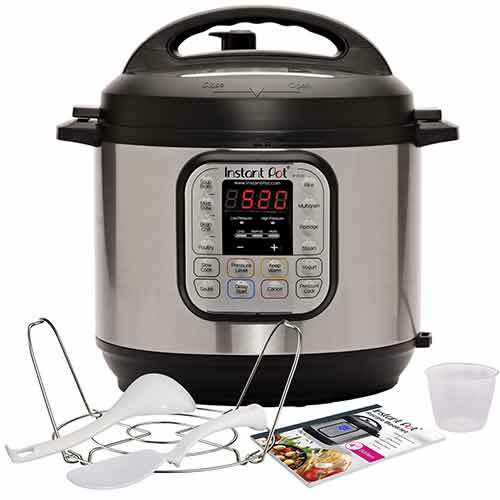 10-in-1 Multi-Use Programmable Pressure Cooker – Pressure Cooker, Slow Cooker, Rice/Porridge Cooker, Cake Maker, Yogurt Maker, Sauté/Searing, Steamer, Warmer, Sterilizer, and the new and exclusive feature to Instant Pot, the Ultra program. New! Ultra program – Developed to provide unlimited control in pressure and non-pressure cooking conditions. You can adjust different parameters based on your favorite recipes and preferences. New! Central Dial – A simple turn and press, for easier and more precise cooking program selection and adjustments. IP has redesigned the Pressure Release Valve so that it resets itself automatically to “seal” when you replace the lid. I think this is great. as for me, resetting the release valve is always an afterthought. Considered as “Next Generation”, this microprocessor is programmable by you to remember specific pressure and time settings you’ve used, based on certain recipes. It has automatic Altitude settings. My take is that the Instant Pot engineers crams so much functionality into this unit, that it’s becoming excessively complex and confusing to use. The more complex an item becomes, the more likely it’ll have reliability issues. Although most owners submitted very positive reviews. When I first started this review, the IP-ULTRA was rated at only 2.8 Stars on Amazon, but now it appears to have jumped to 3.9 Stars. Personally, I’m apprehensive about this unit. Vague documentation – This seems to be true across many products these days, not just electric pressure cookers. The ULTRA may be more complex than other models or brands, but if you want to try many different types of meals and deserts, then you may want the flexibility of the Ultra. The extra programming helps make it easier for you too. Gives you the ability to control the unit from anywhere using your smart phone or tablet. Features high-efficiency and rugged industrial design. Built with 14 Smart Programs – Soup, Meat/Stew, Bean/Chili, Poultry, Sauté, Steam, Rice, Porridge, Multigrain, Yogurt, Slow Cook, Keep Warm, and Pressure Cook, now, your favourite dishes are as easy as pressing a button! Built with the latest 3rd generation technology with an embedded microprocessor. The microprocessor monitors the pressure, temperature, keeps time, and adjusts heating intensity and duration to achieve your desired results every time. Includes dual pressure (low/high), 3 temperatures for sauté and slow cook, and automatic keep warm. Write your own recipe DIY script, save it for future use and share with friends. I think some people may find the Smart feature very convenient for them. I’m not so sure I would trust that my meal was started properly. It would mean preloading the ingredients into the cooking pot early, sometimes much earlier than when you wanted it to start, like say, before you go off to work. If your meal includes some kind of meat, then it would have to sit in the un-refrigerated pot until you start the cook process from your smart phone or tablet while you’re not home. The only way I see that this might be okay, is if you place frozen meat into the pot, or are cooking items that can stay un-refrigerated for several hours while you are away from home. If you were not home by the time the cook cycle is finished, then the pot will have to depressurize naturally without assistance for you. During the time frame that the pot turns off after a cook cycle, and it depressurizes, it’s still using the heat and pressure to cook whatever you have in the pot. You’ll have to take that into consideration when setting the cook time. For me, there’s just too many uncertainties with this option. It cooks so fast anyway, why not just wait to start it until you’re at home to push the start button yourself? Neat idea, I suppose. I just don’t personally need the option. New version of “Smart Cooker” App. is now available for Android devices as well as for iPhones. IP’s updated Application although much better, is still lacking as recipe scripts you’ve entered yourself cannot be searched for. Downloaded and creative “scripts” are now alphabetized, which makes the search easier, but you still have to scroll far to find anything. If you are adventurous, always looking for new recipes to try, then you may welcome the new Smart Pot features. The million and one features for some is exciting, while others have found them to be lacking and not worth the complexity. Several owners wished they had just purchased one of the basic models. 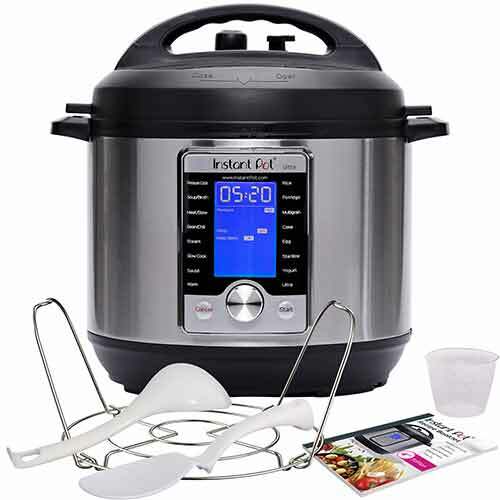 Instant Pot Lux60, 6-in-1, Enhanced Version 3 includes a Cake and Egg program in addition to the Pressure Cooker, Slow Cooker, Rice Cooker, Sauté, Steamer, and Warmer. 12 Smart Built-In Programs – Soup/Broth, Meat/Stew, Sauté, Rice, Multigrain, Porridge, Steam, Pressure Cook, Keep Warm, Slow Cook, and now adds the new Cake, and Egg functions to make your favorite dishes as easy as pressing a button. Design Features: Large Display Panel, Brushed stainless steel, finger print resistant. The new Cake Maker function is supposed to make it easy to make New York style cheesecake, banana bread and other moist cakes, the Egg Program allegedly takes the guess-work out of preparing cooked eggs. An overwhelming majority of owners are extremely pleased with the Instant Pot Lux60 (6-Quart model), and the Lux80 (8-Quart model). I believe any size of the IP-LUX series cookers would a great investment that would make preparing great meals at home very easy for you. Missing the Side Lid holders that the previous version 2 (V2) had, and the DUO still has. Previous version lid you could mount onto the side handles. With this, you’ll need to set lid down on the counter somewhere. Could use a more detailed instruction booklet on basic operations. With this new version 3 (V3) the redesigned lid, you can’t see the float valve to see if it pressurized. This is a very capable, high-quality, multi-cooker, as many have attested to. Although it’s nice to see an improvement on IP’s Pressure Relief valve, sometimes it seems they make changes, just for the sake of making changes, even if it means eliminating some nice features, ex. missing lid mount. The Corsori multi-cookers come with a tall steamer rack, much taller than Instant Pot’s. What’s really nice is that you get a spare seal, and a glass lid to cover the pot in the slow cook mode, or for serving. These are items you must purchase extra with the other multi-cookers. 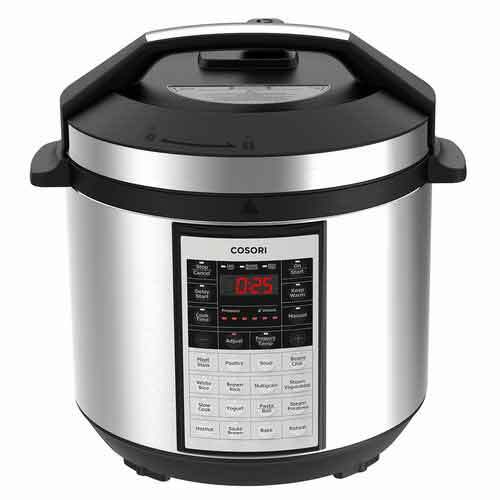 The Corsori models feature more function settings than Instant Pot cookers, such as a separate brown rice and white rice functions, Steam Vegetables, Steam Potatoes, and Boil. However, both brands seem to be equally capable and comparable. Note: One important thing to consider when deciding whether to get the 6-quart or 8-quart size. The 8-quart size requires more water or liquid to be able to reach pressure (2 to 2-1/2 cups vs. the 1 to 11/2 cups for the 6-quart). This can affect the outcome and taste of recipes that call for only 1 cup of liquid. Fair percentage of owners have eventually experienced problems with the seal so that it stops holding pressure, but no more than other brands, usually remedied by replacing the seal. After reading many reviews, I can say that I highly recommend this product. Many seem to be very satisfied with their Cosori cookers. Model: C2126-PC, 4.0 Stars, 456+ Reviews, Price about $68. 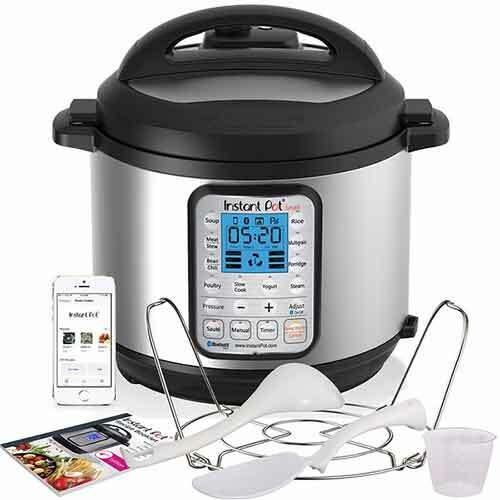 The latest generation multi-function kitchen appliance can be used as a Pressure Cooker, Slow Cooker, Rice Cooker, Sauté Pan, Yogurt Maker, Steamer & Warmer. The different functions are selected by pushing scrolling up or down buttons. This avoids having a button for each function, and simplifies the panel. The Cosori model C2126-PC doesn’t have a ‘Manual’ function, you instead select the type of material you’re cooking, i.e.. This pre-sets the temperature/pressure level that is used. You can then adjust the cook time you want. Instruction booklet lacking in basic information, i.e. how to manually release pressure, or how long to cook things. Has only a very few recipes with questionable instructions. More recipes and a more detailed guide to help newbies would be welcome. 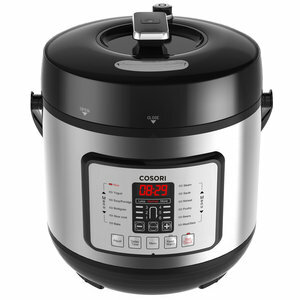 Owners really like this Cosori Model: C2126-PC multi-cooker. The only widely common compliant is the lack of documentation that comes with the unit. Many find instructions and recipes online to guide through their very short learning curve, as it’s simple to use. Reactions are that it’s larger than expected, most everyone agrees that it’s a well made appliance. I have no problem highly recommending the Cosori 7-in-1 as a dependable kitchen appliance. 70% faster than traditional cookware. The main positive feature of this brand/model is that it has a simple key pad, which makes it more intuitive than others. It appears that the functions of this cooker are basic. Indeed, many owners like this cooker because of it’s simple and ease to use. When I go to Power Pressure Cookers site, I find it lacking in details. The entire site is dedicated to this one product, but there’s no mention of the materials used in the manufacture of it. The sites reviews are only highly-positive ones, leading me to wonder if they’re truly unbiased reviews. I’m sure the reviews at at Amazon, YouTube, or the forums are more fair and objective. Despite the lighter-weight materials used to make it, this multi-cooker is well liked and a very capable one. There’s very little information from the manufacturer to form an objective opinion on this product, only the reviews. Although a majority of positive reviews exist for this pressure cooker, this one had incurred the highest percentage of negative reviews, by far. Most people find that it works well when it does work, but a good many of these cookers seem to just quit working. The problem is generally electrical in nature. This company must’ve sold many of these unit, due to their TV infomercials. If you’re determined this is the model you want, I hope it works well for you. Personally, I do not recommend this unit. Though somewhat less expensive than other brands, it still has most of the capabilities of the others. That said, the quality of the unit is not on the same level of the others. Bella has all the safety measures in place. 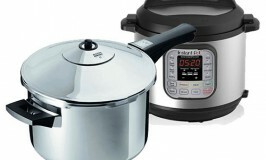 Inexpensive as pressure cookers go, yet offers most of the features of the more expensive units. Light weight aluminum with non-stick coating cook pot, rather than the heavy-gauge stainless steel of the Instant Pot and Cosori cookers. 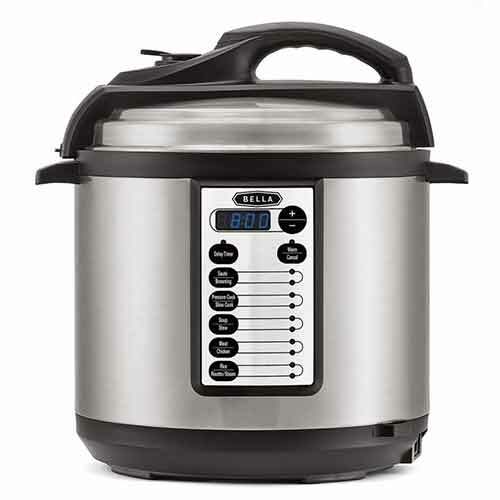 The BELLA BLA14467 is an easy to use, inexpensive pressure cooker, offering features found in the more expensive units. The BELLA BLA14467 offers non-pressure modes too, but don’t rely on the instructions to learn about pressure cooking or for recipes, as you’ll find them lacking. You may want to get a good pressure cooking cookbook for that. 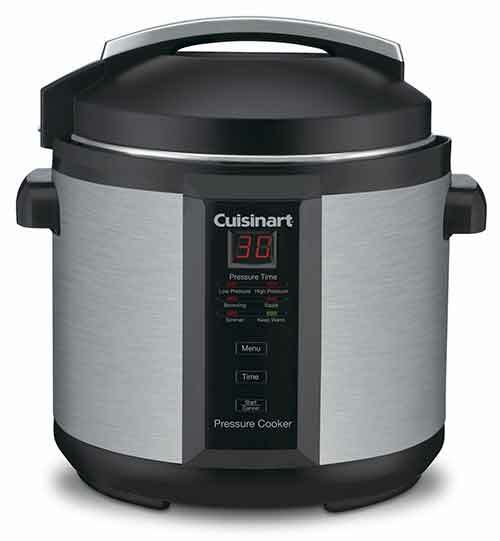 I suppose I might recommended this multi cooker for those on a budget, but I’d rather spend a bit more a buy either an Instant Pot, Cosori, or Cuisinart. Model: 7211002162, 3.2 of 5 Stars, 210+ Reviews, Price about $65. The lid is attached to the base unit and not detachable. I can imagine that since you must be careful not to submerge the base, because of the electronics, it may be difficult to clean the hinged lid. At least one owner finds it awkward when removing and reinstalling the sealing gasket from the lid to clean it. Pressure Release mechanism keeps your hand away from the steam vent with a single touch. I’m not certain that this cooker would satisfy the expectations of many perspective buyers. The GoWISE USA 8-Quart Pressure Cooker/Slow Cooker includes a removable and durable stainless steel cooking pot, steam rack, steam basket, rice scooper and measuring cup. The outer body is stainless-steel with cool touch handles. The gasket sealed lid is self-locking. 12 Presets help making cooking easier. Steam, Rice, Multigrain, Porridge, Saute, Soup, Meat/Stew, Bean/Chili, Poultry and Yogurt, egg maker, and slow cook. I started out reviewing model number GW22703, but wound up favoring this model GW22623 because of improvements over the GW22703. The GW22623 has a heavy duty Stainless steel cooking pot instead of the ceramic coated aluminum of the other model. You can get the GW22623 in either Copper, Silver, or Stainless Steel finishes. GoWiseUSA calls this cooker their “4th Generation”, which now has two lighted readout displays, one is the timer and one is the pressure readout. What is great is that the readout gives an actual pressure reading, rather than just an indicator light. This is excellent in that it gives you much more insight of the status of the cooker. The GW22623 is a good looking unit with a solid feel. It appears that a good many owners really like this cooker. As with any brand of PC, you can find a small percentage that have experienced difficulties or even failures, this unit is no different. Still, a majority have never experienced any issues at all. A fair percentage of owners seem to have problems with the pressure release valve not sealing properly, thereby not allowing pressure to build. As with other bands, the reviews are mixed, although the majority are very positive. The latest versions of GoWiseUSA models are improved with a Stainless Steel inner Pot. The digital readout of the working pressure is an great feature. Based on features, opinions and track record, I can definitely recommend this multi-cooker. Model: CPC-600, 4.3 Stars, 1550+ Reviews, Price varies around: $90. Cuisinart updates a classic! Our brushed stainless pressure cooker is safe, easy to use, cooks up to 70% faster than conventional methods and cooks healthier, too. Steam trapped in the pot builds up pressure that creates hotter temperatures, and the pot is so tightly sealed that vitamins and minerals can’t boil away. Foods stay moist and flavors stay true. 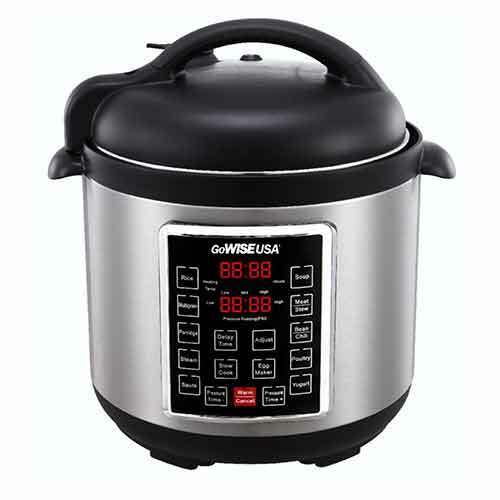 Features variable pressure and temperature settings, plus Browning, Simmering and Sauté functions for perfect roasts, stews, vegetables, cheesecake or custard. The Cuisinart Pressure Cooker is absolutely safe, with a lid that has to be locked in place before pressure builds, and stays locked until pressure is released. Includes: Recipe Book and Trivet. Simplicity of the push-button controls. It has a minimalist design that’s easy to understand. Some reviewers mentioned they like this. Cook Pot difficult to remove from the cooker. Generally, most current owners are very pleased with this cooker. The vast majority of reviewers have given it high ratings. Consumers like the ease of use and quality-feel of the control pane and the ease of use. Although the included manual seems to need correcting, it’s a well-liked and capable multi-cooker. 3.5 Stars, 310+ Reviews, Price about: $125. Good Housekeeping awarded the LUX Electric Multi-cooker the ‘Good Design Award Winner 2017’ when tested against 9 other models from leading brands. Good Housekeeping’s lab used 68 pounds of meat, 44 pounds of vegetables and 18 cups of rice to test 10 electric multi-cookers. They used cooking performance, ease of use and safety features as criteria for the comparison. Allows you to change the pressure setting. Most others only allow you to change the cook time. Basic Control Pad layout is easy to use and understand. Has most of, but not all of the functionality of most other multi-cookers. The removable pot is thin aluminum with a non-stick ceramic, PFOA-free coating. In my opinion, this is less desirable than stainless steel. Needs better quality control of manufacture, but that can be said of every brand. I believe the Fagor LUX series cookers would be a good investment for your kitchen. It’s has proven itself to be reliable among many satisfied owners. For me, the ease of tossing in a few ingredients, pushing a couple of buttons and walking away for a short period, is my favorite thing about my pressure cooker. The meals are always easy and delicious, so I use mine at least once or more times a week. The very small amount of energy used is another reason I love it. You might also be wondering which models are the easiest to understand and operate and which are the easiest to clean up too! Today’s pressure cookers feature built-in programs that make it easy to do specific things, but also allow you to vary the pressures and cook times too for when you want the flexibilty. Thousands and thousands of electric pressure cookers have been sold on Amazon and the reviews are overwhelmingly positive, so I don’t put as much emphasis on those. I don’t believe all of the positive reviews a product receives. Some of the most positive reviews sound like advertisements and may have even been left by the manufacturers themselves. I tend to trust negative or the not-so-positive reviews more than the positive reviews, so I’ll I focus more on those for my opinions. I’ll go to forums, review sites, YouTube and elsewhere to find real opinions, from real owners of how their cookers actually work in real-world usage. I like to find reviews from people who’ve been using their cookers for awhile, rather than from someone who just cooked their first or second meal with their brand new cooker. Consider the amount of food that you might be preparing at any one time. Typically, a pressure cooker can only be safely filled to about 2/3rd’s full. If you’re preparing a large roast, you may want to consider going with the larger 8-quart model, rather than a 6-quart, unless you expect the majority of your meals fitting the 6-quart pot. You may want to cook in two sessions, the main course first, then any side dishes. If you’re cooking for 3 or 5 people, then a 6-quart will probably be a good fit. Any more and you’re better off with an 8-quart model. Once you push start on you cooker, it takes time for it to come up to pressure. Depending on how much volume of food and liquid is in your pot, and the temperature of the ingredients, this may take up to ten minutes or more. Once the temperatures finally reach a point where the pressure builds, that’s when the vent will set itself in the closed position. Your pressure cooker will then start building higher temps and pressure, and your cooker will then start the countdown cook timer. Note: One important thing to consider when deciding whether to get a 6-8 quart cooker, or larger than 8-quart. The larger size cookers require more water or liquid to be able to establish pressure (2 cups or more vs. the 1 to 1-1/2 cups for the 6-8 quart). The majority of recipes online work in the 6 and 8-quart cookers. If you try to make the same recipe in a larger pot, you may realize it won’t establish pressure in a larger pot. If you add more water, this may dilute the flavor of your meal. For whichever electric cooker you choose, I suggest you take extreme care NOT to submerge your electric multi-cooker cooker during cleanup, or splash water onto the control pad. Only the pot and the lid can be submerged, of course. Luckily, the base is easy enough to wipe clean. To help avoid pressure problems (establishing or maintaining pressure), make sure you carefully wash the lid, the gasket seal, and the pressure vent port after each use. All of the best electric pressure cookers have multiple built-in safety features. Even though I don’t typically use the function keys, I find my pressure cooker to be extremely useful and easy to create delicious meals very quickly and inexpensively. There are literally thousands of free recipes out there on manufacturers websites, on YouTube, on Pinterest, on Facebook, and personal and professional cooks’ websites! So you’ll never run out of ideas. You’re sure to find some very easy ones that will quickly become your favorites! Go ahead, explore and try some. I’ve tried many and it’s made me a hero with my family. Most cookers automatically shift into a ‘keep warm’ mode when the cook time has completed. Personally, I find this unnecessary as the cooker holds heat very well, even when it’s not on. On many occasions, I’ve had to remove the inner container to get it to cool to room temperature in a reasonable amount of time. Pressure cookers are moist cookers so any crispy dish you desire has to be done outside of the cooker. For example, chicken skin doesn’t come out the same as if it was roasted in the oven or on the grill, but you can finish your lasagna, chicken or whatever in the broiler or on the grill to get that baked finish. Everyone seems to absolutely love their electric pressure-cookers, …until they stop working. The sealing ring can become damaged or deteriorate over time and fail to allow the cooker to build pressure. This issue can usually be overcome by installing a new seal or vent valve. It appears an even smaller percentage of units of any brand quit working after a period of time due to the electronics failing. Personally, I’ve never had any issues with mine after two-years of regular usage of at least twice a week. It seems that these problems are rare. Rather than putting more effort and complexity into adding new programming features into their new models, I’d like to see manufacturers improving their designs to overcome the electrical and pressure leakage failures that plagues models from every brand. 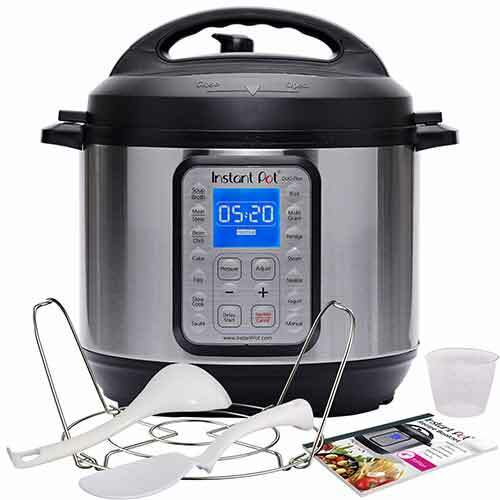 In 2009, the Instant Pot Company was founded by a Canadian team of technically-oriented, food preparation enthusiasts who’s goals were to find solutions that would enable busy families to quickly prepare wholesome meals right at home. 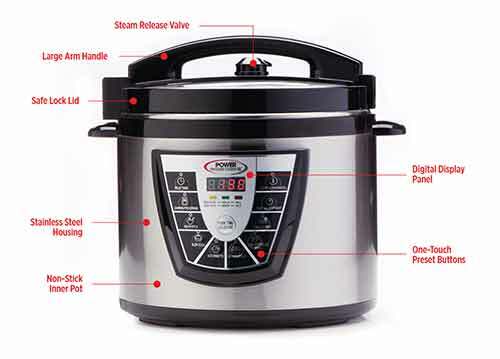 They designed a new type of electric pressure cooker by adding microprocessor controls. This allowed them to add programmed cooking functions to their pressure cooker. This “3rd-generation” technology was a smashing hit with consumers and professionals alike. Try one of our easy and delicious Pressure Cooker Recipes! Thanks for taking the time to provide this very informative overview of various pressure cookers on the market.